Leader of the Labour party Jeremy Corbyn has been accused of calling prime minister Theresa May ‘a stupid woman’ by Conservative MPs. The comments apparently came at the end of prime minister’s questions today (December 19). MPs are claiming Corbyn muttered the insult under his breath after May mocked his decision not to call a vote of confidence towards the prime minister. 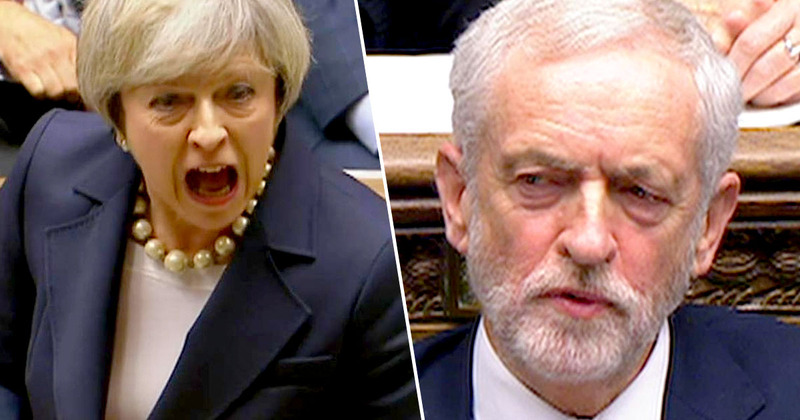 The pair were engaging in another heated debate at PMQs, and the apparent insult came after the pair’s final exchanges of the session. I know it’s the Christmas season and the pantomime season. He’s going to put a confidence vote – oh yes he is, oh no he isn’t. I’ve got some advice. Look behind you! They are not impressed and neither is the country. With nothing better to do after the debate – I’m guessing the government has some spare time on its hands with nothing big looming on the horizon like, erm, Brexit – a number of Conservative MPs raised the issue with May in the House of Commons, with former Tory chair Patrick McLoughlin, asking the Speaker, John Bercow, to censure Corbyn. The MPs who raised the matter were the Commons leader Andrea Leadsom, the Conservative vice-chair Paul Scully, Tory backbencher Anna Soubry, as well as McLoughlin. Bercow, however, refused to intervene, saying he did not hear or see the exchange. Leadsom then criticised Bercow himself, and claimed he’d not apologised after he once apparently called her a ‘stupid woman’ in another debate in May this year. The Speaker was reported to the standards watchdog over the incident, The Guardian reports. Shortly after the alleged insult, Paul Scully mentioned it to the prime minister. This year, when we’ve been celebrating 100 years of women getting the vote, do you think it’s appropriate language to call people a ‘stupid woman’ in this chamber? Can I say to my honourable friend that I think that everybody in this house, particularly in this 100th year of women getting the vote, should be aiming to encourage women to come into this chamber, and to stand in this chamber and should therefore use appropriate language in this chamber when they are referring to female members. While you can’t hear what Corbyn is saying on video footage from the incident, some people are suggesting he said ‘people’, rather than ‘woman’, referring to the Tory party as a whole. Many people also picked up on the fact an issue like this is easily jumped on in order to distract from other matters. Quite something to see the British media making more of what Jeremy Corbyn did/did not say than they did when Theresa May reinstated the whip for a confidence vote in herself to two men still under investigation for sexual assault. Priorities, hey? The “stupid woman” row is a mildly interesting microcosm of our politics, I suppose: we can see Corbyn said “woman” not “people”; experts can be found that say he said “woman”; but he can still deny it, and his supporters will believe him. And eventually it will be forgotten. Here's Corbyn responding to May at 1/4 speed. A spokesperson for the Labour leader has said Corbyn said ‘people’, rather than ‘woman’. Speaker John Bercow has also said he’ll now look at the footage of the alleged incident and would expect Corbyn to return to the House of Commons if he needed to make a finding against him. Corbyn is expected to make a statement on the matter later today (December 19).